To connect and keep up with today’s tech-savvy students requires continuous learning from academics themselves. At Wittenborg University academic staff recently completed the first year of an intensive Teacher’s Training programme which will continue in the new academic year. The coordinator of Wittenborg’s School of Business, Abdul Rauf, said the purpose of the training was to improve the quality of teaching at the university. This includes widening lecturers’ repertoire of and competence in teaching and assessment methods, to foster the habit of reflective teaching and to increase knowledge and the effective use of digital learning aids. 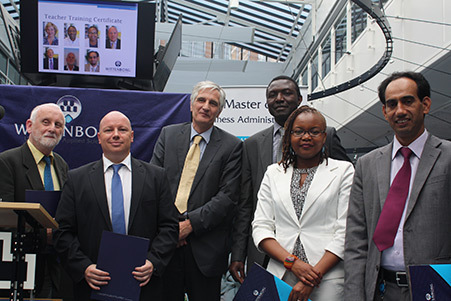 The training consisted of six sessions, making use of the expertise of international as well as Dutch contributors, including Wittenborg’s Academic Dean, Dr Jacques Kaat. All have extensive experience in higher education teaching. The main area covered by the training was on assessment and evaluating. Particularly how academic staff develop their exams, how those are evaluated and what are the criteria in developing it. In addition, teachers also learned about academic research-based learning, student supervision and final project marking. Equally important was a session on critical self-reflection and personal development. The aim being able to engage in a professional dialogue with peers in a range of developmental areas. “We would like academic staff to think how they can continually improve themselves as professionals. How they can develop personally and professionally,” Rauf said. Another session was on digital didactics and information literacy. “More and more we see how education is based on a digital learning environment. If you are in the classroom a lot of resources is provided online. The idea is for teachers to better equip themselves and how to use these resources effectively. We use the plagiarism detective software Turnitin, so that was also part of the training: How to use that software more effectively in checking for plagiarism, to differentiate in fact when it is plagiarism and when it is not. In addition the training also covered how teachers can keep their online areas up to date and provide additional learning material to students besides textbooks or classroom resources. Also part of the training was keeping in step with international higher education approaches and practices. “It is important to keep all our academics up to date with the current trends and changes in higher education learning, best practices and effective approaches,” Rauf said who acknowledged that rapid technological advances is the biggest change teachers are facing. “We discussed this from two point of views: One was from the generational point of view. What are the differences between the older generation and the current generation? Who is Generation X, Y and Z? What are their expectations? How they can learn better, engage in the classroom environment better and what teachers need to know. Secondly, this generation is shifting from paper to paperless and or technological learning and understanding. They want to have 24/7 connectivity to the Internet. What avenues are available to Wittenborg students for feedback on the quality of teaching they receive? “We provide as many opportunities as possible for all our current students to give feedback,” Rauf said. “Formally we distribute a structured module evaluation form. This is a self-selection method of selecting the sample. It is up to the student if they would like to fill it out or not. We process this feedback within two weeks and share it with the teacher involved, HR or the program coordinator. If that feedback is positive we don’t normally take any action other than acknowledge and give our appreciation. If there is any negative feedback or an issue or a concern, we act upon it straightaway. All feedback are also discussed during academic staff appraisal. In addition, all students can provide some feedback through the Student Representatives or their tutors of course. Whatever feedback we receive, we try to learn from that: How we can improve and how we can avoid a repeat if it’s a negative issue. “Furthermore we also have our own system of evaluation. For example, we have peer evaluation in the classroom where some teachers or the program coordinator sit in on colleagues during classes and they try to assess the program. Mostly this is done if there certain issues arise or if we hire new teachers."